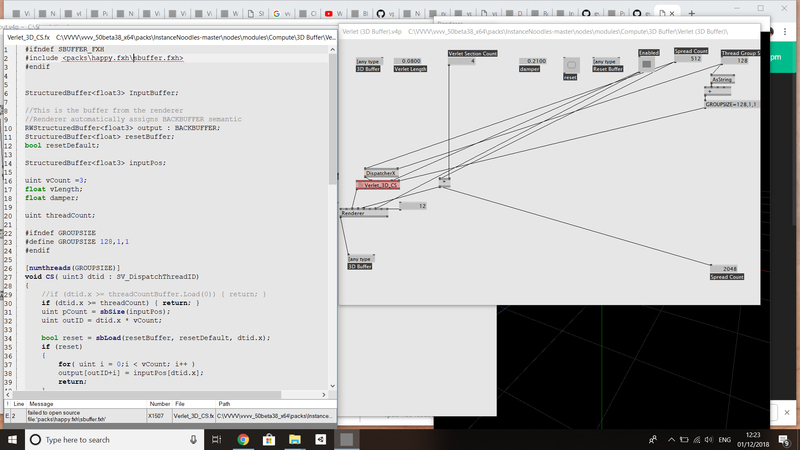 “00:16:25 * : didn’t create node; [C:\Users\Achim\Desktop\vvvv_50beta36_x64\packs\noodles\nodes\modules\DX11.GeomFX\Wobble (DX11.GeomFX)\Wobble (DX11.GeomFX).v4p, without name (ID: 40)]: inserting Patch C:\Users\Achim\Desktop\vvvv_50beta36_x64\packs\noodles\nodes\modules\DX11.GeomFX\Wobble (DX11.GeomFX)\Wobble (DX11.GeomFX).v4p into ? (?) would lead to anarchie. 00:16:25 - : To help us track this error down, enable the ExceptionDialog via the menu or starting vvvv with /showexceptions. It was working fine on this machine before I did a clean windows install. Hi schlonzo ! I am a new vvvv user and I am having similar isues with red nodes in instance noodles. Have you been able to find the solution to this problem ? install this as well and you should be good. that had been the issue.